June 5 - Saint Boniface, Bishop and Martyr - Memorial - My Catholic Life! In the treasury of the cathedral of Fulda, Germany, there is a medieval Codex, a large, bound book of prayers and theological documents, which very likely belonged to St. Boniface. The rough cover of the Codex is deeply sliced with cuts from a sword. A tradition dating back to the generations just after St. Boniface’s time attests that he wielded this very book like a shield to ward off the blows of robbers who attacked him and a large band of missionaries in northern Germany in 754. Our saint tried to protect himself, both metaphorically and literally, with the written truths of our faith. It was to no avail. St. Boniface and fifty two of his companions were slaughtered. Ransacking the baggage of the missionaries for treasure, the band of thieves found no gold vessels or silver plates, but only sacred texts the unlettered men couldn’t read. Thinking them worthless, they left these books on the forest floor, to be recovered later by local Christians. One of the earliest images of St. Boniface, from a Sacramentary from Fulda dating from 975, depicts the saint deflecting the blows of a sword with a large, thick book. The Codex is a second class relic giving silent witness to the final moments of a martyr. St. Boniface is known as the “Apostle of the Germans” and is buried in the crypt of the cathedral of Fulda. But his baptismal name was Winfrid, and he was born and raised in Anglo-Saxon England, not Germany. He was from an educated family, entered a local monastery as a youth, and was ordained a priest at the age of thirty. In 716 he sailed to the continent to become a missionary to the peoples on the the Baltic coast of today’s northern Germany. He was able to communicate with them because his Anglo-Saxon tongue was similar to the languages of the native Saxon and Teutonic tribes. Winfrid was among the first waves of those many Irish and Anglo-Saxon monks who saved what could be saved of Roman and Christian culture in Europe after the Roman Empire collapsed. Large migrations of Gothic peoples, mostly Arian Christians, pagans, or a confusing mix of the two, filled the vacuum created after Roman order disintegrated, and needed to be inculcated in the faith and culture they had participated in decimating. Winfrid traveled to Rome the year after first arriving on the continent, where the Pope renamed him Boniface and appointed him missionary bishop of Germany. After this, he never returned to his home country. He set out to the north and proceeded to dig and lay the foundations of Europe as we know it. He organized dioceses, helped found monasteries, baptized thousands, pacified tribes, challenged tree worshipping pagans, taught, preached, held at least one large Church Council, convinced more Anglo-Saxon monks to follow his lead, ordained priests, appointed bishops, stayed in regular contact with his superiors in Rome, and pushed the boundaries of Christianity to their northernmost limit. He was indefatigable. He was in his late seventies, and still pushing to convert the unconverted, when he was surprised and slain in a remote wilderness. St. Boniface was well educated and many of his letters and related correspondence survive. But he was, above all, a man of action. He was daring and fearless. He was a pathbreaker. He had the faith to move mountains and throw them into the sea. His labors, combined with his great faith, are the stuff of legend. More incredibly, though, they are the stuff of truth. St. Boniface, through your powerful intercession, help all those who labor for the faith to be as intrepid as you were in challenging those who reject Christ. May your example of tireless witness inspire all missionaries, both at home and abroad, to persevere. 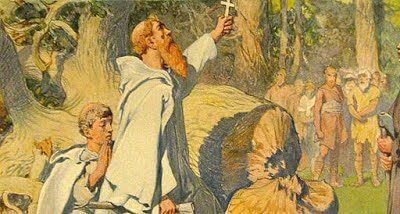 ST. BONIFACE was born at Crediton in Devonshire, England, in the year 680. Some missionaries staying at his father’s house spoke to him of heavenly things, and inspired him with a wish to devote himself, as they did, to God. He entered the monastery of Exminster, and was there trained for his apostolic work. His first attempt to convert the pagans in Holland having failed, he went to Rome to obtain the Pope’s blessing on his mission, and returned with authority to preach to the German tribes. It was a slow and dangerous task; his own life was in constant peril, while his flock was often reduced to abject poverty by the wandering robber bands. Yet his courage never flagged. He began with Bavaria and Thuringia, next visited Friesland, then passed on to Hesse and Saxony, everywhere destroying the idol temples and raising churches on their site. He endeavored, as far as possible, to make every object of idolatry contribute in some way to the glory of God; on one occasion, having cut down on immense oak which was consecrated to Jupiter, he used the tree in building a church, which he dedicated to the Prince of the Apostles. He was now recalled to Rome, consecrated Bishop by the Pope, and returned to extend and organize the rising German Church. With diligent care he reformed abuses among the existing clergy, and established religious houses throughout the land. At length, feeling his infirmities increase, and fearful of losing his martyr’s crown, Boniface appointed a successor to his monastery, and set out to convert a fresh pagan tribe. While St. Boniface was waiting to administer Confirmation to some newly-baptized Christians, a troop of pagans arrived, armed with swords and spears. His attendants would have opposed them, but the Saint said to his followers: “My children, cease your resistance; the long-expected day is come at last. Scripture forbids us to resist evil. Let us put our hope in God: He will save our souls.” Scarcely had he ceased speaking, when the barbarians fell upon him and slew him with all his attendants, to the number of fifty-two. Reflection.—St. Boniface teaches us how the love of Christ changes all things. It was for Christ’s sake that he toiled for souls, preferring poverty to riches, labor to rest, suffering to pleasure, death to life, that by dying he might live with Christ.